Great display catches attention so you might as well use it to your advantage. Here MB shares some wisdom from those that already do. The Legend�s Barber Shop (thelegendsbarbershop.com, @The_Legends_) uses display to really express their positioning and successfully so. Adrianna Garcia says �We started six years ago and wanted an old school grooming shop. Our window really captures a lot of attention. There is a large hotel just 50 metres from here and a lot of footfall. You can watch as people slow down and then stop, some take photo�s, some come in. We set our retail like American Crew into the displays and it really works.� Mixing your retail up with the right props can draw the eye. Joe Cotton of Carter&Bond (carterandbond.com, @CarterandBond) has two shops in Notting Hill and Chelsea, he says �We focus on heritage brands and each has a strong point of difference. I love sourcing vintage toys and paraphernalia and I use these as props or features around the displays. Although I have no formal training it�s one of the things that I enjoy most about this business. Whenever possible I also pick up interesting pieces of vintage furniture and shop fittings that I think will lend themselves to displaying products. 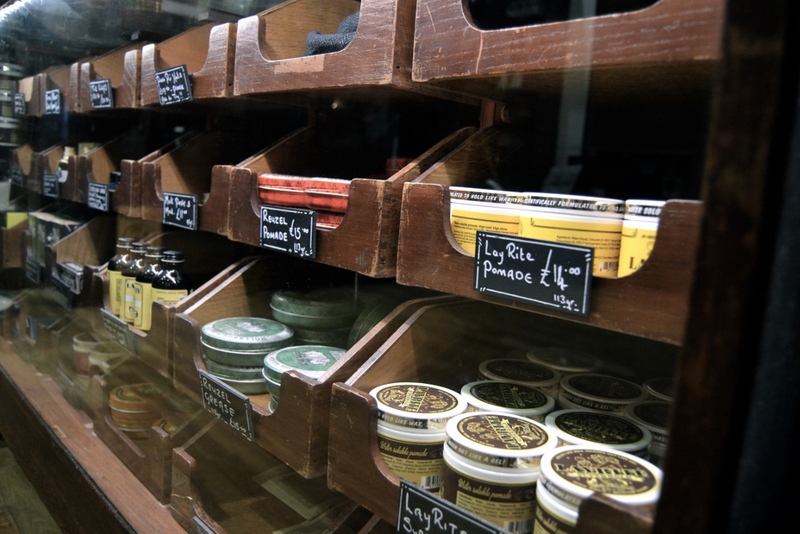 Savills in Sheffield (savillsbarbers.com, @savillsbarbers) also puts antique displays to great use and the displays are designed to encourage browsing with clear pricing and labelling because when it comes to the Great British Public, frankly, we hate asking! Owner Joth Davies says �I sell Edwin Jagger razors and products, Lucky Tiger, Reusel, Layrite�I also sell antique cufflinks and recently added Pork Pie hats and Baker Boy hats and I can�t restock them fast enough. For Christmas I added more boy stuff for stocking fillers like antique style bottle openers and whisky stones that you put in the freezer so that they keep the drink cold but don�t dilute it. People are waiting for a haircut anyway so they might as well shop here too,� explains Joth.